Wow. 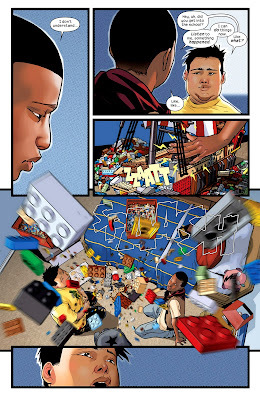 To say I’m impressed with the level of writing in Ultimate Spider-Man #2 may be the biggest understatement of my life. This is easily one of the best issues of any comic I’ve ever read, and certainly one of the best this year. Being less than enthusiastic with the last issue I was straining to figure where Bendis was trying to go with the Ultimate Spider-Man story. In just this comic alone my heart and mind have done a complete 180 on the topic. 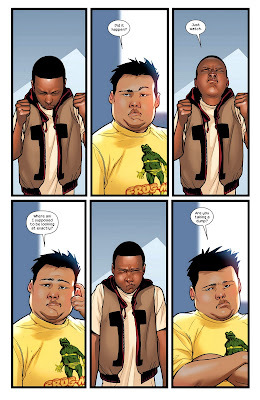 Ultimate Spider-Man #2 is heartfelt, fun and lively. I loved every bit of it. From the emotional shots of sadness and fear on Miles' face (as he realizes that he may be a mutant) to the dower defeated look of his father, there’s so much humanity. 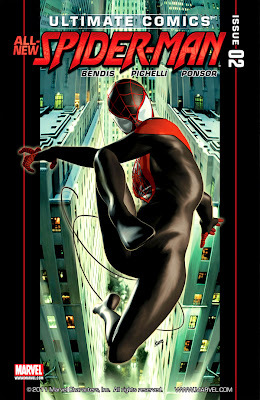 It doesn’t feel like an origin story either, it may be the gradual pace that Bendis is taking or it may stem from his focus on each person and not on Miles’ powers exclusively – although his abilities are featured heavily they don’t dominate the spotlight. Miles, his father and (what appears to be the comic relief) Ganke, Miles’ best friend are the major focus. What made me really sit up strait in my seat was the conversation with Miles and his father. Miles doesn’t talk like a kid. He speaks like and adult, sure he may not fully understand but he doesn’t lash out like a stereotypical adolescent boy. Miles has a sense of understanding and calmness that intrigued me. He really showed subtle traits that fleshed out his personality more, and differentiated him from Peter Parker – something that he desperately needed to do. 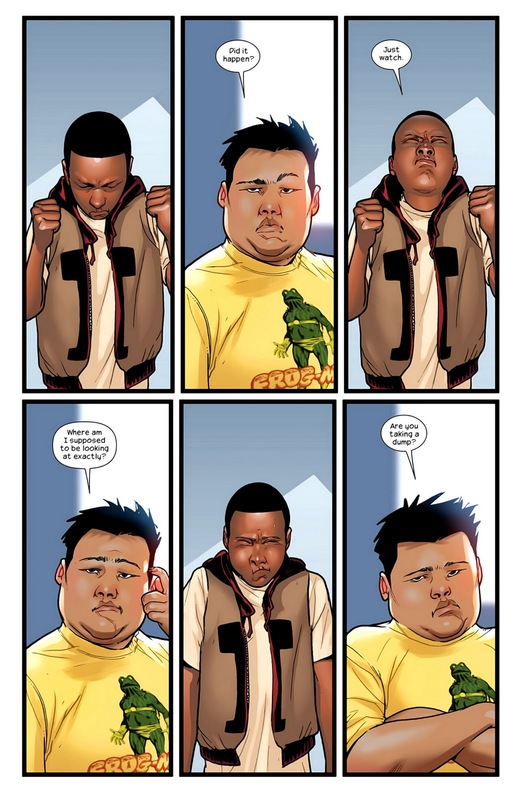 Amid Miles’ origin Bendis was able to inject some much needed humor. Miles’ friend Ganke only has a few pages, but he was a welcomed addition. Ganke may only serve one purpose, but Miles to this point doesn’t show the same wit and charm that Peter showed, maybe Ganke can bring that out of Miles. Maybe Miles will have a stern demeanor while fighting crime, the only humor in the issue coming from Ganke himself. 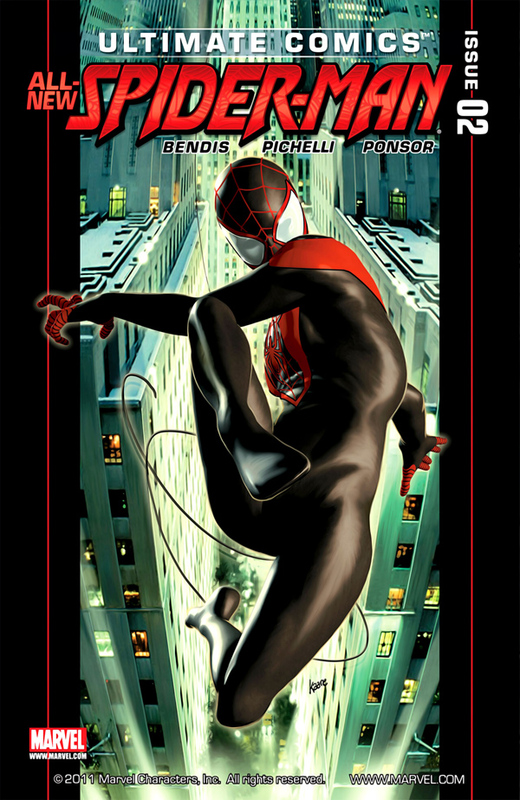 However Bendis decides to handle it Miles story has quickly become a must read for any comic fan. With just one issue he turned Miles into a person, not somebody who’s only defining characteristic was his skin color. Miles is much more than that, and Ultimate Spider-Man has really found its voice.